But I’m pretty sure that the Phoenix Soda Fountain is one of the best things going on in downtown Knoxville just now. As current slang would have it, this place is lit. 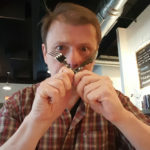 I have experience with sugar highs and plenty of exposure to the euphoria that comes from eating well, but I don’t know that I have had those two elations mingle with such intensity and longevity as they did following my visit to the Phoenix. The buzz lasted for hours. It’s possible that it’s all sugar, but I doubt it; there’s a healthy dose of nostalgia that comes from just walking into the place: an attractive menu of sundaes and other soda fountain treats created with a chefly consideration; rich, satisfying and homemade ice cream; a staff of folks who really like being at work; and a happy, feel-good vibe. That’s a lot of dopamine for a place the whole family can enjoy. 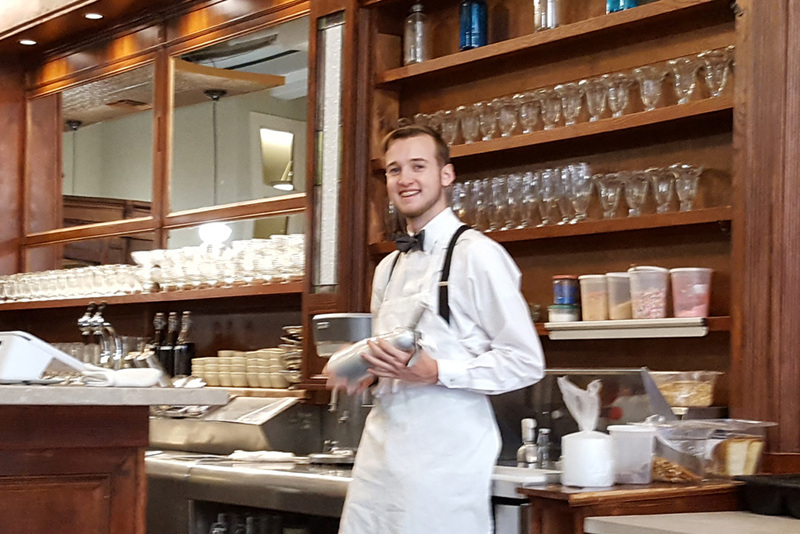 Nolan Sherrill is the mind and, sometimes, the man behind the soda fountain. 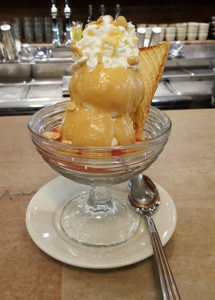 He claims “a real, deep passion about food,” and that ardor is evident in every sundae, shake, and seasonal special that comes across the marble-topped bar. That marble (which also tops the tables) is a part of an overall design aesthetic that recreates the feel of the late 1930s and early 40s, with many pieces of decor dating from that time. And, Sherrill is proud to point out, that includes the soda fountain itself. Furthermore, the Phoenix features true soda jerks wearing white shirts and aprons. Retro design is nothing new, of course, and we’ve all been fooled by skin-deep accuracy that doesn’t sink into the experience itself. But, blissfully, that is not the case at the Phoenix. In fact, he was insistent on showing me the walk-in cooler, which, if you’ve seen one, you’ve seen plenty. But the Phoenix’s walk-in is full of hand-labeled and dated containers of everything that goes into making already great ice cream into an extra-special treat. The only outside packaged goods I saw in there were the cherries, along with milk and cream. I don’t know what ice cream tasted like in the 1940s, but I can’t imagine it being better than what this soda fountain serves. 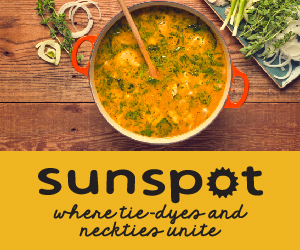 It’s dense without being stodgy and rich without weighing you down. It’s great as a scoop, but when it gets full soda-fountain treatment, it’s remarkable. 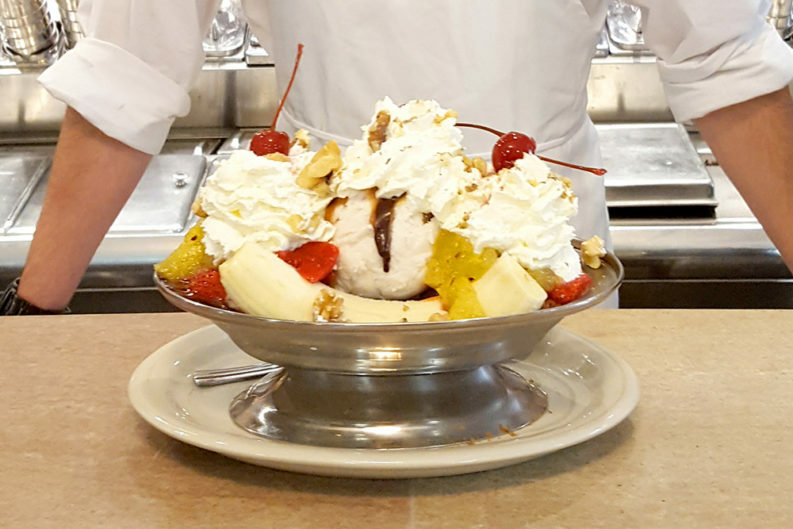 The banana split is a work of art—attractive, tasty, and huge. It’s not a reworking of the classic; but with its topping of homemade pineapple compote, caramel, and hot fudge, it’s almost a brand-new taste sensation. It remains amazing to me how easy it is to get used to, and even come to like, processed and preservative-thick imitations of real food. Even the cherries are tasty—they’re from Washington State’s Tillen Farms and, unlike the average shockingly red Maraschino, these long-stemmed beauties are made without using artificial colors, artificial flavors, sulfites, and preservatives. One of Sherrill’s original creations is the K-PB&J sundae, a tribute to the Kern’s Bakery. It starts with vanilla cake and strawberry syrup, two scoops of vanilla-bean ice cream, and gets topped with a fine homemade peanut butter sauce. And then it’s garnished with a waffled Kern’s Bread curl, which is awfully cute on its own but you’ll like it better if you spread it with a little bit of everything else—including some of the mountain of whipped cream that tops the whole thing. It’s fun and delicious. But for my buck, almost nothing in the whole dessert pantheon matches the mind-blowing experience of the Great Smoky Mountain Sundae. Exaggeration, you think? 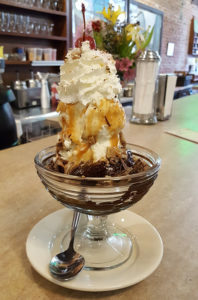 Nope—this is a tower built on both warm chocolate brownie and vanilla cake, drenched with hot fudge, then dressed with vanilla ice cream, warm caramel, and, of course, whipped cream. But what transports this sundae to Olympian heights is the generous sprinkle of Olive and Sinclair’s Smoked Nib Brittle. Nibs are unsweetened bits of cacao beans; Olive and Sinclair smokes them in the very reputable smokehouse that belongs to Alan Benton. The smoky flavor and crunch elevate the treat into a complex, very haute cuisine-like treat. If you’re an aficionado of fine spirits, take a moment to ponder the flavor combination. You may very well want to invite your whiskey-loving friends along for this non-alcoholic but intensely flavorful moment. On the other hand, the simple goodness of an ice cream float brings sheer pleasure, too. I tried the Strawberries and Cream, which is nothing more than a scoop of strawberry ice cream and a fountain glass full of Sprecher’s Cream Soda. But the scoop is as big as a cat’s head and the combo almost made me giggle, but don’t quote me on that. I wish I could I treat every reader to a sample of what Sherrill and company shared with me, but I’m convinced you’ll want more, so you’re better off getting your own—besides, being abstemious in most things mood-altering, this a treat I’m inclined to bogart. Hours: Wed.–Fri. : 12 a.m.–10 p.m., Sat. : 11 a.m.–10 p.m., Sun. : 12 p.m.–8 p.m.